Next Saturday I’ll be speaking at Hen Harrier Day London and South East at Rainham Marshes, and for once, it seems we’ve actually got something to celebrate at this annual event, which was set up to highlight the plight of this magnificent bird of prey. I’m really proud that the RSPB played a direct role in protecting seven of these nests; three in Bowland in Lancashire, three in Northumberland and one on National Trust land in Derbyshire. I’m particularly pleased about the nests on the United Utilities Bowland Estate as it’s the first time hen harriers have bred there since 2015. For many years Bowland was the last remaining stronghold for English hen harriers and we were beginning to worry that they had abandoned their traditional breeding site for good. But through a lot of hard work, and successful partnership working with raptor workers, United Utilities and their tenants, we’ve seen hen harriers nest in Bowland again. But while we are celebrating this rare good news, we’ve also got to put it into context. Even though this year has been successful compared to recent years, the nine successful nests are a long way from where we should be. Experts estimate there’s sufficient habitat in England for 300 breeding pairs. We’ve also seen a complete lack of nests in Yorkshire, despite all the suitable habitat there, and no nests at all on privately owned grouse moors. Furthermore, we know from satellite tagging chicks through our Hen Harrier LIFE project (which has been running for four years) that birds are continuing to meet their ends in suspicious circumstances and illegal persecution is still happening. 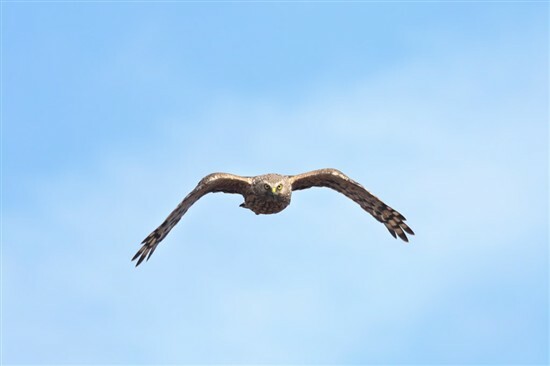 Only this week, we reported on the suspicious death of Welsh hen harrier Lia – her body was found in area with a history of illegal raptor persecution, with fractured tail feathers. Today, we report that more than 30 of hen harrier chicks have been tagged this year, the majority of them in Scotland. Of the birds tagged in 2017 almost 40 per cent are known to have died from natural causes, in line with these low survival rates. As the tags continue to transmit after a bird has died the remains of many of them were able to be recovered allowing post mortems to be carried out. These showed some to have been predated, while others died of starvation. One bird, Eric who was tagged in Orkney in July 2017, apparently drowned in January. However, the tags also reveal that over a quarter of last year’s chicks have disappeared in suspicious circumstances. In these cases, transmissions from tags that have been functioning perfectly suddenly stop. The tag of one bird, Calluna, ended transmissions abruptly over a grouse moor a few miles north of Ballater on 12th August last year. Manu and Marc, from the same Borders nest, both disappeared over grouse moors in northern England. This year’s results also need to be seen through the lens of wider UK declines. Every six years there is a full UK Hen Harrier Survey and the most recent one in 2016 revealed that the population size is continuing to fall. The estimate for the UK and Isle of Man in 2016 was 575 territorial pairs, a 13% decline since the last full survey in 2010, and a significant decline of almost a quarter (24%) since 2004. The UK Government has (for example see here) identified that the illegal killing of hen harriers is the main reason for their continued decline. Until this issue is addressed we will not see healthy breeding populations of hen harriers. Certainly, we don’t believe that brood management is the solution so I’m pleased to confirm we have now been granted permission for a Judicial Review challenging Natural England on the decision to grant licences for hen harrier brood management. As I’ve said before (for example see here), the RSPB believes that more action is needed to improve the environmental quality of our uplands and end the illegal killing of birds of prey. This is why we propose the introduction of a licensing system for driven grouse shooting, as well as vicarious liability which would hold the landowner accountable for any bird of prey crime on their property. I hope to see some of you at Hen Harrier Day at Rainham Marshes next Saturday or that you will show your support by attending one of the other events happening around the county next weekend, where you will also find RSPB staff speaking about their passion for hen harriers. Great work again by the RSPB as I understand most of the Hen Harrier nest we’re guarded night and day by RSPB staff and volunteers. Very well done to all concerned but the greatest test is yet to come that being that all these fledged Hen harriers continue to do well and are not shot, poisoned or disappear in suspicious circumstances on other grouse moors like the Welsh Hen Harrier has done. Listening to the BBC Farming Today programme yesterday I felt the words of the chief Executive of the Moorland Association were mostly skilful propaganda. Without the day and night nest guarding I doubt the successful fledgings would have been anything like the numbers we have seen. As I say the “pudding is yet to be eaten” regarding the continued welfare of these young Hen harriers. So let's hope the proof is revealed in the coming months but I have great doubts. Don’t relax for one moment RSPB on pressing for licensing of grouse moors and vicarious liability for grouse moor owners. We will win this battle for Hen harriers but it will be a long had road. Looking forward to being at Rainham Marshes on the Saturday for Hen Harrier day. Looking forward to seeing you at Rainham, Martin.